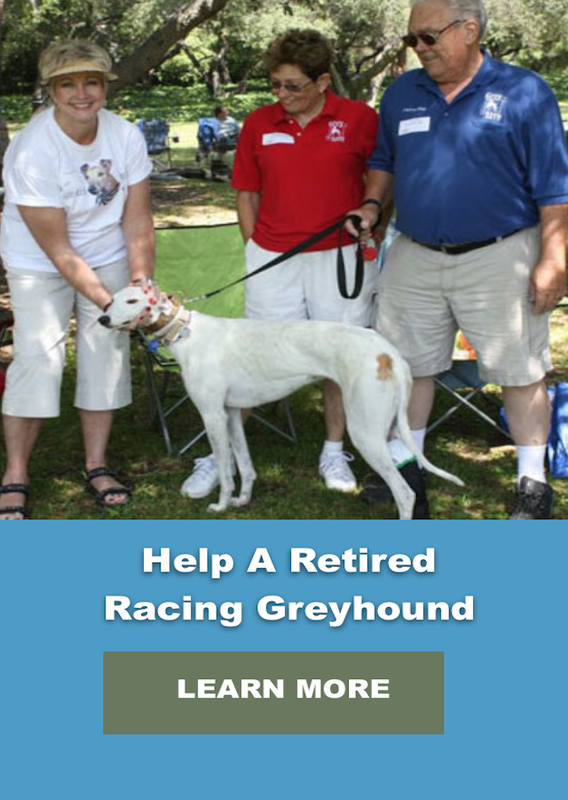 GreySave greyhounds, with a few exceptions, begin life on a racing greyhound breeding farm. Greyhound litters are usually between five and ten puppies. They weigh between .75 and 1.75 pounds at birth. At three months their ears are tattooed with the date of birth and their National Greyhound Association litter registration number. Pups are allowed to begin running at two months, but formal racing training begins at six months. By one year, pups reach their full size of 50-80 pounds. At about 18 months of age, greyhounds begin their racing careers. Greyhounds love to run, and undoubtedly enjoy the racing part of track life (they think that they're hunting, not racing each other, by the way). They live in racing kennels near the track. Each kennel, which is independently owned and operated, may have 40-50 dogs of both sexes living in 3 by 4 foot crates stacked two high. They spend most of their days in these crates, apart from racing twice a week and being let out into a small run to relieve themselves four times a day. The dogs are usually owned by their breeder or an invester and just managed by the kennel. A greyhound's winnings are split between track, kennel, and owner. Greyhounds who do not earn money, or who suffer an injury that ends their racing career are retired or "graded out." Regardless of how successful they are, all greyhounds must retire by age five. This used to mean, for most of them, that they were destroyed. But, increasingly, tracks have become sensitive to the concerns of Americans and want to cooperate with groups like GreySave to give these dogs a life after retirement. 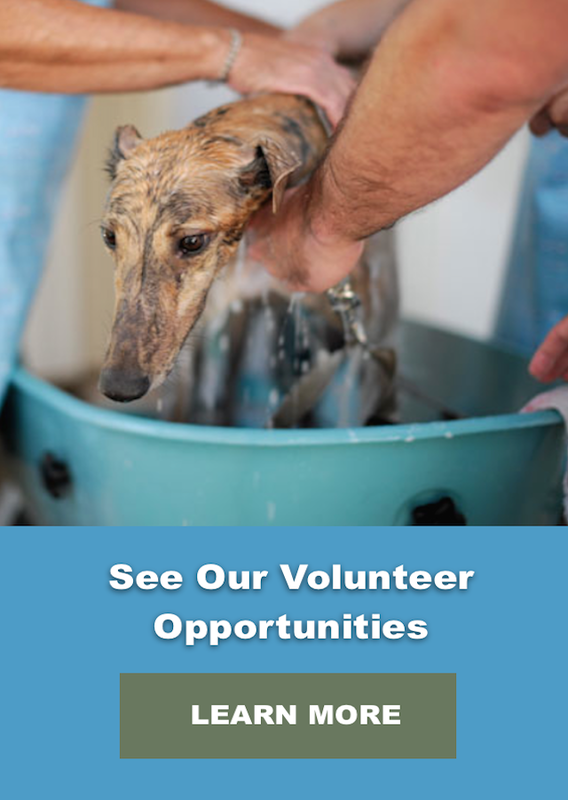 We think that about 75% or more of greyhounds retired from the track are now being placed in homes through the efforts of many groups around the nation. 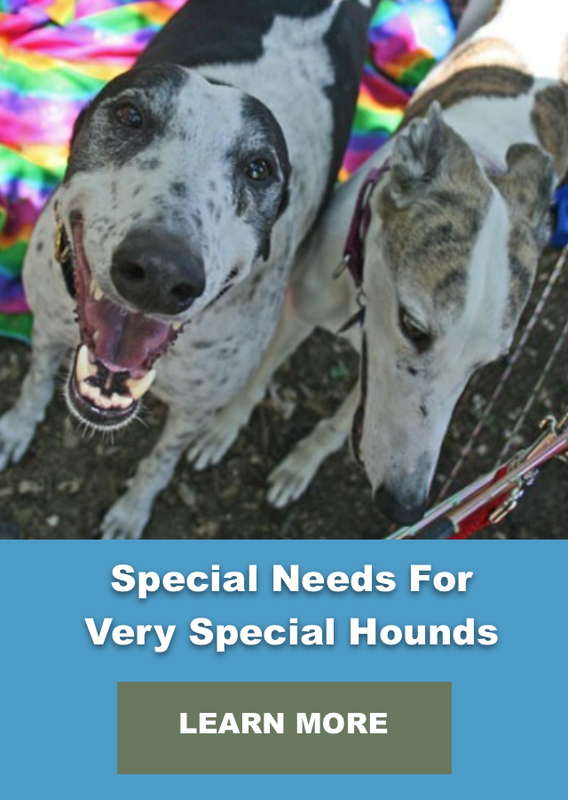 GreySave, like many greyhound adoption organizations, takes a neutral stand with respect to greyhound racing. While our members are entitled to their views, as an organization we neither support nor condemn racing. It is worth noting that greyhound racing has been declining in popularity for a number of years. Every year brings a new story of a track closure, such as the recent announcement that the Cloverleaf Greyhound Track in Loveland/Fort Collins, Colorado, switched from live racing to broadcasts from other tracks. Treatment of dogs at the Caliente track is governed by the U.S.-based National Greyhound Association, and nearly all of the dogs there were bred in the U.S.
Go to GreySave Homecoming Day for the next phase of your greyhound's last lap--the lap from the track to your home.